The Italian foreign minister has said that at the Libyan crisis meeting in London today, there seemed a chance of restoring the ruptured relations between Presidency Council chairman Faiez Serraj and Central Bank governor Saddek Elkaber. Paolo Gentiloni said he saw “a glimmer of hope in finding in finding a compromise to break the stalemate between the Libyan government and the Central Bank and put the necessary resources in the heads of the head of the government Faiez Serraj as he tries to consolidate economic and political stability”. Serraj last week launched a fierce attack on Elkaber accusing him of failing to fix the liquidity shortage and not protecting the value of the dinar. Elkaber hit back saying Serraj had had no economic policy and was ruining the economy. 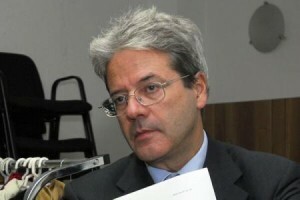 Gentiloni added that such a compromise between the two men would also help the PC make a steady reduction in the number of “irregular migrants”. He said that he thought addressing the country’s economic problems was the most significant step that could be taken. He warned that as well as the lack of liquidity in the banking system, there was growing anger among employees who were no longer being paid. Getting a grip on finances would help the government restore infrastructure, particularly for oil and gas. One of the Libyan attendees today was National Oil Corporation head Mustafa Sanallah as well as Elkaber. Serraj was joined by fellow PC members Ahmed Maetig and Fathi Majbri and foreign minister-designate Mohamed Siala and planning minister-designate Taher Al-Juhaimi. The London meeting was co-hosted by British Foreign Secretary Boris Johnson and US Secretary of State John Kerry. Other countries present were France, the UAE and Saudi Arabia along with UN Special Envoy Martin Kobler and representatives of the World Bank and the IMF. This evening, however, dissident PC member Ali Gatrani called the London meeting a conspiracy designed to impose the will of outside governments on Libya. He said that the House of Representatives was the legislative body and the fate of the Libyan Political Agreement and the adoption of the state budget was in its hands. He added that the PC had been inquorate at its meetings since they were not always attended by the chairman and all of his five deputies as, he maintained, is required under the LPA.